Underneath the Brass Fortress lies the maintenance tunnels and subterranean chambers of the Mechanical Fundament. It houses the Cogitum Centralis which contain an automated defense system that is controlled by a master factotum, in order to protect the Throne Aligned, The control center of the Clockwork City. 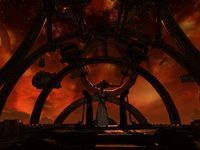 The Throne Aligned is also where Sotha Sil stored his thoughts and notes and is deadly for a mortal to access it. Sotha Sil dwelled in the Cognitum Centralis in the Second Era. This page was last modified on 24 February 2019, at 11:07.